The black 1967 Ferrari Dino roared down the curving country lane toward the castle frowning down from the hillside half a mile ahead. 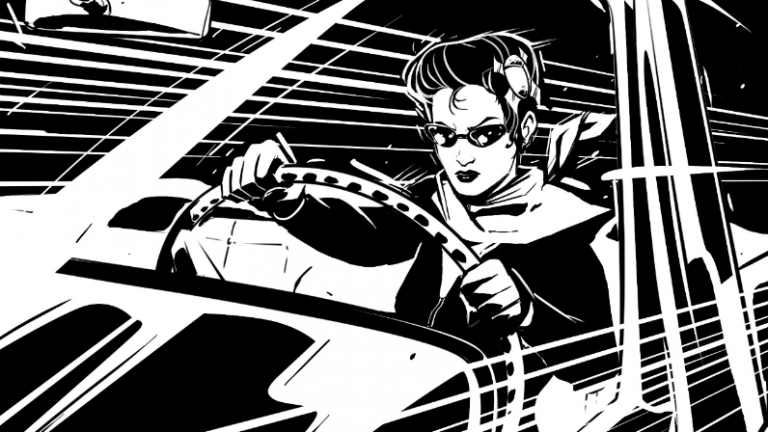 The woman at the wheel was just as sleek and dangerous-looking as her famously streamlined sports car. Mira was dressed in a black leather coat and matching suede pants, and wearing sunglasses despite the fact that it was dusk. Her jet-black mane—as dark as the spaces between stars—was pulled back and fastened with an antique jeweled scarab clip. Rather than make her appear dowdy, this hairstyle accentuated her high cheekbones and perfectly shaped ruby lips. Her skin was so pale that at first glance she looked like a statue carved from the purest alabaster. The voice came from a tiny transmitter she wore inside her ear, and it interrupted her thoughts like an annoying bug. It was a male voice, with a thick Russian accent speaking in English—a voice that she always found to be excruciatingly smug. Mira ignored him. Her graceful yet firm hand clutched the round chrome shift knob with two fingers and a thumb, like a queen toying with her scepter, as she downshifted from third to second and back again, accelerating out of a sharp bend. The German landscape raced past the windows—a blur of trees, low rock walls, and the occasional random goat grazing by the roadside. “The Tsar must have the relic,” he replied. She cut him off by plucking the earpiece from her ear and tossing it in the passenger seat footwell. She sighed. The Coven was crawling with men like Porfiry: toadies of the Tsar who were too anemic to actually go out and do the Coven’s dirty work. Right now Porfiry—the pudgy oaf—was safely ensconced in the Saint Petersburg headquarters, watching her every move on a computer screen via satellite, trying to direct her as though she were his drone and he the joystick-jockey. If she had her way, men like him would be weeded out of the Coven. In the coming battle there would be no place in the Tsar’s ranks for the weak of body or mind. Rounding a hairpin turn, she floored the gas pedal as she came out onto a straightaway, bombing down the lane leading to the castle, throwing up Autumn leaves in the car’s wake. She smiled, revealing long pointed fangs. This sports car had been the pride and joy of the billionaire from whom she had borrowed it. He wouldn’t miss the rare toy, though. The dead had no need of possessions. Mira pulled up to the castle gates and came to an abrupt stop. The engine growled expectantly, waiting to tear off down the road again. She gazed at the rusting wrought-iron work emblazoned with the family crest: a snarling wolf’s head and a dueling saber. This was the sigil of the once legendary and now infamous von Sabrewulf family. She remembered a story that her grandfather had told her and her sister Maya when they were girls—a tale of German aristocrats who purposefully lacerated each other’s faces with sabers so that they could bear a mark of honor. Mira and Maya had promptly gone out and taken turns cutting each other with their pocket knives. If men weren’t afraid of scars, they wouldn’t be either. She wondered where her sister was now. The last time she had seen her was five years ago. The pair had been sent to Russia, ordered by the Night Guard to assassinate the self-proclaimed “New Tsar” and wipe out his growing vampire army. But they’d been lured into a trap—cornered in the depths of the labyrinthine caves deep beneath the Ural Mountains. Maya had been severely wounded with little chance of escape. So Mira had done what any sister would do for her beloved sibling. She’d rushed down a corridor with a pack of explosives, hurling them at a band of skeletal wendigoes and their vampire handlers, causing a massive cave-in that allowed Maya to escape, but burying Mira in rubble. The vampires had pulled her broken body from the debris and taken her to the Tsar himself. A crow cawed loudly, startling her from her thoughts, filling her with foreboding. She did not like crows. They were harbingers of misfortune for the coven. The bird was sitting on the von Sabrewulf crest, staring at her with an inquisitive eye, its beak open wide. She hissed at it and the crow flapped its wings and took off, soaring over the weedy gravel road leading to the castle standing a hundred yards away. She watched the bird until it disappeared in the branches of one of the many overgrown trees lining the lane. She could hear more crows screeching in the distance. She wondered why there weren’t any ravens about. This place was called Ravensburg, after all. She peered through the gates. The von Sabrewulf manor wasn’t a romantic looking place, she considered. Not like the immense castle of Neuschwanstein that had made this region famous: that castle was all spires and towering walls, like something out of a fantasy movie. But the von Sabrewulf home was a decrepit and sprawling place made up of an assemblage of buildings spanning a thousand years: dark, grand and crumbling…the perfect setting for a Gothic novel. On one end stood a Medieval crenelated turret—the oldest remnant of the von Sabrewulf origins. Modern windows had been fitted into the places that had once served as arrow loops. “Just like me,” Mira said to herself. It had grown dark. She took off her sunglasses, revealing cat-like pupils. There were no signs of any security guards on the grounds. But the wall surrounding the property was high and topped with rusted iron spikes. And she could see a single light emanating from a lower window of the turret. Somebody, or some thing was there. And a very very bad man. Gennady had climbed the ranks of the new Russian Plutocracy with cunning and viciousness, like a brutal warlord from an earlier age. No one would weep for his death. Mira had met him at an exclusive club a few days before and he’d fallen for her at first sight. It had all been arranged by the Tsar, of course. He needed a way to get her from Russia to Germany without the prying eyes of governments or the spying of the megacorporation Ultratech with its powerful artificial intelligence leader: the ever watchful ARIA. The sentient machine had become aware of the Tsar and had been trying to track his and the Coven’s movements. At Mira’s urging Gennady had flown her to a private airport in Switzerland in his personal jet, thus bypassing customs. The Ferrari Dino had been waiting on the tarmac to speed them across the border to Germany, and then to Gennady’s penthouse in Berlin—his getaway bachelor pad that he’d been dying to show her. But Mira had never intended on taking that detour. And the billionaire had expired with a baffled look on his cruel face. She reached inside the trunk, casually pushing aside the body to pull out a black steel case. Then she opened the heavy lid to reveal foam-fitting compartments containing a pair of scarab-adorned gauntlets—bloodstained gloves dominated by ten finger-daggers ending in wicked points. These were the Gloves of Rasavatham—a perverse version of the Philosopher’s Stone. They tapped into a vampire’s blood, morphing its plasma into liquid metal by an arcane alchemical process. A vampire’s blood could then be wielded as a living weapon. But the process was extremely taxing, and a user of the gauntlets had to quickly replenish the store of plasma, otherwise the wearer would start to fade. Pulling up her sleeves to reveal bare forearms covered with puncture wound scars, Mira paused for a moment, steeling herself for what was about to happen…for the rush of mingled pain and pleasure that came with donning these ancient weapons. The gauntlets had been given to her by the Tsar himself upon her initiation ceremony; and she both loved and hated them. As if summoned by her words, six insect-like fangs protruded from each gauntlet, plunging into her skin. She arched her back and let forth a groan. Was it ecstasy or agony? The sensations had become one and the same. The veins of her forearms pulsed and bulged like purple worms under her skin; and then the veins in her neck did the same. Now she was ready for anything that might cross her path. Slamming shut the trunk, she headed down the road and away from the gates, her boots crunching on the gravel. As she went by the passenger seat window she could just make out Porfiry’s voice emanating from the earpiece on the car floor. He was frantically shouting something. Screaming at her about the relic, no doubt. She shrugged and kept walking. Porfiry was prone to hysterics. She would find the treasured object and lay it at the feet of the Tsar, despite Porfiry’s lack of faith in her. After she had gone five hundred feet along the wall she paused and looked around. The only living things she saw were some black goats in a field on the other side of the road. Satisfied that she was alone, she leaped straight at the wall and stuck to it, digging into the stone with her talons. Then she scaled the twenty-foot-high face with the skill of a lizard. When she neared the top she swiped at the spikes embedded there, snapping them like twigs, then deftly bounded over the other side, dropping to the ground. She waited there for a moment, her back pressed against the clammy wall. The moon would rise soon, but it was dark now. The first bats were out, squeaking their high-pitched echolocation sounds. Mira reached out with a lightning fast motion and grabbed one right out of the air. The little head poking from her fist stared at her with its beady eyes, tiny fangs bared, and its pig-like nose twitching. “Do not be afraid little sister,” Mira said. The “flying mouse” as the Germans called them, squeaked with fear, and Mira smiled. “Back to the hunt.” She released the animal, then sprinted across the grounds until she was standing underneath the turret’s ground floor window. She peered into a chamber—a sitting room of sorts. It was decorated as one would expect: leather bound books, oriental rug, oil paintings on the walls. A fire was burning in the hearth; and there was an enormous grey dog curled up on the rug in front of it. A giant wolfhound of some breed. But this “dog” was wearing tattered trousers! Mira smiled wryly. She had never seen a werewolf before, but she realized that she was looking at one right now; and it was poor Konrad von Sabrewulf himself. She had heard stories about how he had tried for many years to cure himself of his lycanthropy. How he had gone through unbearable treatments, subjecting himself to arcane potions and magic in a futile effort to recapture his humanity. And here he was now, relegated to playing the family dog. Picking the lock on the servants’ entrance with her taloned finger was simple. The lock’s tumblers clicked into place, and just like that Mira was inside the manor house, slipping quietly along the marble floors like a shadow, her nocturnal eyes seeing everything despite the dark. She had memorized a map of the place—the Coven had acquired a copy of the original architect’s drawings from the German historical archives. Knowing just where to go she quickly arrived at the ballroom. What had once been a fabulous hall—with two huge arched windows and a grandiose staircase on one end—had been turned into a madman’s laboratory. There was an operating table with reinforced leather straps attached, and antiquated machinery hanging from the ceiling…a Tesla coil of some sort. A makeshift furnace—resembling something from a rusting steam engine—had been constructed against one wall. Arcane medical equipment and other paraphernalia lay strewn about. She glanced up at a pair of severed arms preserved in formaldehyde hanging from wires. She turned around and saw a portrait hanging on the wall opposite. It bore the likeness of a young, rakish man with a strong chin and weak eyes. She knew that this was a painting of Count Konrad himself—or was he a Baron? Tanto faz! It didn’t matter! The picture showed the aristocrat before the accident that had turned him into a monster. He’d been a gambler and an addict in his youth. His own stupidity had led to his affliction, for in a drunken stupor he’d cut himself on a trophy in the Night Guard’s collection—a werewolf’s claw coated with dried blood. And thus his agonizing metamorphosis had begun. Looking around at the scientific equipment she imagined the torment Konrad had endured…heard his tortured screams turning to howls as he tried to stem the metamorphosis. She remembered her own transformation after the Tsar had infused her with his dark elixir. At first she had rebelled against the cold venom that had coursed through her veins, screaming with rage, locked in a cell, guarded day and night by wendigoes reeking of the grave—sickened to her core as her upper and lower canine teeth were slowly pushed out by the new fangs that had erupted from her gums. The first blood she’d tasted in her mouth as a vampire had been her own. But afterwards…after she had accepted what had happened, she had embraced the power that had come with her rebirth. Light was temporary. Darkness always prevailed. And she had succumbed, giving her heart—but mostly her soul—to the Tsar. She would help him usher in the new age. The harsh call of a crow once again startled her from her reverie. She could see it through one of the arched windows, circling over the tower. The moon had just risen and illuminated the shapes of other crows. There was an entire murder of them soaring over the mansion. Looking up she saw something with hieroglyphs emblazoned on the spine. Her heart beat faster as she reached for it. But when she took it off the shelf and opened the cover, she realized that it was nothing more than a scholarly treatise on grain shipments under the rule of the Ptolemies of the last dynasty. She flung it aside with annoyance. A crow sang out in the distance. An excited and raucous cry. The skin on the back of Mira’s neck tingled. Without thinking she hurled herself from the ladder, landing on the floor on all fours with a cat-like grace. A split second later a massive object exploded through one of the window arches. It slammed into the bookshelf behind her with an earsplitting din, sending books flying, blasting the ladder to bits, then fell onto the marble floor behind her with a deafening clang. Mira swore under her breath as she realized what she was looking at. It was the Ferrari. Smashed nearly beyond recognition. And something outside had hurled it the hundred yards from the road to the mansion. Mira got up cautiously and made her way through the thick dust to the window and peered into the dark. Both of the manor’s gates had been ripped off along with a good chunk of the wall on either side. Whatever had caused this mayhem was now moving down the lane—a great lumbering shape with blue lights shining like headlamps—pushing through the overgrown trees. Was it some kind of military vehicle? An Ultratech war machine? She could feel the ground trembling as it moved. There was something else down there too: the figure of a man walking out in front of the thing—a muscular man with a bare chest and feathers in his hair, holding axes in both hands, the silver edges of the blades glinting in the moonlight. Dozens of crows were flying around him, keeping pace with his strides. “Tsar’s blood!” she hissed, realizing that the huge hulking thing was the war-golem Aganos; and the man with the crows was the Killer Instinct fighter known as Thunder. Created by ARIA, the Killer Instinct tournament was a modern-day gladiatorial contest pitting the world’s best fighters against one another, as well as against Ultratech’s creations. Aganos and Thunder had both fought in the tournament; and each was a dangerous combatant. But what were they doing together? And why were they attacking the von Sabrewulf castle? Was this what Porfiry had been trying to warn her about after she’d tossed away the earpiece? Just then a blood-curdling howl erupted from the turret. Mira dashed back to the bookcase, scrambling over the remains of the Ferrari. How would she find the relic in this mess now? Then her heart skipped a beat. The force of the hurled automobile had caused the wall to move at an odd angle, revealing a hidden space behind. She squeezed through the opening and found herself in a twisting stone stairwell. Moving down the steps, she turned in tight circles, her eyes instantly adjusting to the darkness. After going down twenty flights of stairs she started to see a yellow glow, and then suddenly she found herself in a massive chamber—a catacomb much larger than the ballroom above. There stood row after row of high oak bookshelves and wooden crates stacked against the walls from floor to ceiling. The place was lit by an old chandelier that flickered erratically. In the dim glow she saw scrolls and ancient tomes; archaic weapons and other antiquities. She moved down middle row of books, heading deep into the heart of the chamber. In the center of the room was a small open space containing a solitary carved wood stand. Displayed on it and protected under a glass case was a book bound in cracked leather. Upon the cover was affixed a gold figure: a scarab-headed man—Khepri, the Egyptian god of rebirth. She had found the relic! She reached out a hand to take it but stopped short. Something was moving behind her. And it was snarling like a wolf. The sky had frozen solid while he’d slept. It was cold blue and streaked with crystalline clouds. But the clouds did not move, and the blurred light from the sun illuminated this strange vision as though it were emanating from behind a thick wall of rippled glass. The man stared at this beautiful vision for the longest time as he slowly came to his senses. He lay there quietly trying to remember his own name. Trying to remember how he’d gotten here. But nothing came to him. His mind was muddled. He blinked and tried to lift his head, but it was stuck to the ground. Reaching behind his neck he yanked free his frozen hair. Then he sat up and yawned. A great jaw-cracking yawn coupled with a throaty exhalation—the sound a polar bear might make after a winter’s rest. The vapor from his breath filled the air, rising upward toward the blue vault above. He stood up on stiff legs and reached up toward the bluish light. His hand touched cold hard ice. He scraped his fingernail across the smooth surface, plowing a thin furrow in this ceiling. He was inside an ancient glacier. But how…and why? His eyes alighted on a metal object lying on the white floor. A massive double edged sword with a wolf’s head carving affixed to the handle between the hilts. The graven blade was covered with intricate inlaid runes.